As Saratoga prepares to open on Friday, it's already been announced that Justify won't be appearing there this summer. In 2015, there was American Pharoah. The following year, Songbird. Last year, the individual winners of all three Triple Crown races ran in the Travers for the first time in 35 years and the 4-year-old Gun Runner came out of upstate New York a legitimate Horse of the Year contender. For the last three years, Saratoga has benefited from having the biggest stars in racing perform on its grand stage. As Saratoga prepares to open its doors Friday, it has already been announced that Justify—racing’s current biggest star—will not be appearing here (or anywhere else) this summer. 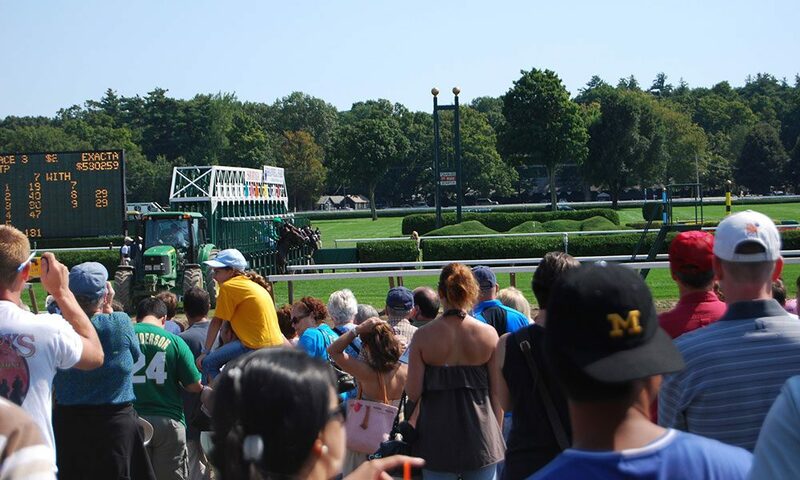 The Saratoga experience begins Friday for the first of 40 days of high-quality racing through Labor Day (Sept. 3). After an opening four-day weekend, racing will be conducted on a six-day week, this being the only track in the country operating under such a schedule. Business has been monstrous the last three summers. Last year, all-sources handle was a record $682.1 million, the third consecutive year of topping the $650 million mark. While Mother Nature has played a significant role in that department, Kay said the high quality of racing the New York Racing Association offers every summer as well providing something new for the fans have played equally big roles. New this year is the introduction of The Stretch, which NYRA is saying is the first significant renovation to the grandstand since the mid-1960s. The Stretch is an area located in upper stretch—roughly around the three-sixteenths pole—and offers barstool seating, various types of social boxes, and regular seats with amenities including 10-inch to 15-inch tablets on which one can watch and wager on the races. Some of the social boxes come with couch seating, some have swivel chair seating and can accommodate from four to 12 people. The area has its own private wi-fi and restrooms. The capacity is from 650 to 700 patrons. Admission prices to The Stretch range from $25 to $150 per person, depending on location and day. As far as the racing goes, there aren’t many changes to the stakes schedule. The $1.25 million Travers—and six other graded stakes—on Aug. 25 highlight the meet. The Grade 1, $1.2 million Whitney on Aug. 4 tops a five-stakes program. While the Grade 1 Alabama on Aug. 18 is typically the biggest race for 3-year-old fillies at the meet, this year could be different. Sunday’s Grade 1, $300,000 Coaching Club American Oaks is scheduled to feature a meeting between the division’s two top fillies, Monomoy Girl and Midnight Bisou. Monomoy Girl is not expected for the Alabama. The 2-year-olds are always a highlight of the Saratoga meet. Last summer, Caledonia Road and Good Magic both debuted up here and by year’s end were divisional champions. Todd Pletcher won his 13th Saratoga training title last summer, besting Chad Brown—the 2016 leading trainer—by one. Pletcher didn’t think he had the depth to win the title last year and believes the same is the case this year. Brown won his third Belmont spring-summer title with 33 victories. Over his last 50 starters, he had 7 wins and 16 seconds. The jockey race figures to be a battle between brothers Jose and Irad Ortiz Jr. Jose Ortiz has won the last two titles. Irad won the 2015 title and is coming off winning the Belmont spring-summer title. This story originally appeared on DRF.com. Visit DRF.com for additional news, notes, wagering information, and more.